Rust is the common term for various compounds that consist of iron and oxygen. It generally forms when free iron is exposed to the oxygen in air and water. Rust in drinking water can cause the water to be yellow, orange, red or brown, depending on the concentration. 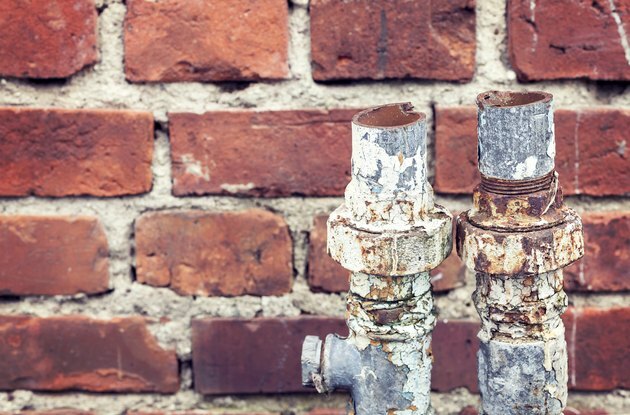 It’s typically the result of rusty water pipes and well water may have a naturally high concentration of iron. You can remove rust in your drinking water with water softeners, oxidizing filters and sequestration. Install an oxidizing filter before the water softener in the water line. These devices typically contain a material with a coating of manganese oxides. These compounds convert soluble iron compounds in the water into insoluble iron compounds. These compounds may then be filtered out of the water mechanically. Oxidizing filters are most suitable for treating water with a medium concentration of iron where the pH is at least 6.8. Use a chemical solution feeder to add polyphosphates to your water supply. Polyphosphates are large molecules that contain phosphorus. They disperse the iron in the water so that it doesn’t form rust. A polyphosphate chemical feeder is most often used for well water and is more expensive than other solutions. Therefore, it is generally used only for severe rust problems. Add about a half gallon of bleach to your water supply. Allow the water to sit for about 12 hours and run the water until your water supply no longer contains bleach. This method is effective when the rust in your water supply is produced by bacteria.